Here’s another aerial photo I took, right before we landed at Ross Green Lake. This is the terminus of the Tana Glacier. It used to be possible to hike from Ross Green Lake, east of here (to the left) across the glacier, and around to Iceberg Lake. As you can see from this photo, the Tana Glacier has become an array of crevasses – not something one can easily, or safely, hike across. The route hasn’t been hiked in a few years. I wish I had an opportunity this trip to explore it a little more, and possibly find a new route across. It looked to me, from the air, like it was possible slightly to the north of here, but I can’t say without hiking it first, or at least a good look from the ground – from the air, in a place as vast as this, perspective is everything, and things are often not as they appear to be; the scale is so hard to gauge. I like the story this photo tells – of the place of ice and water on rock, and how this stuff works. Look at the rock in the foreground, and the debris surrounding it, torn, cracked, splintered and shattered by power of the ice and a little gravity. In the background, you can clearly see a medial moraine, running down between the seam of 2 glaciers that run together off the great Bagley Icefield to create the Tana Glacier. I did get to hike, one afternoon, down from our camp to the Tana Glacier and walk around it a bit. it’s amazing being on the ice. I’ll post some photos from that hike later. 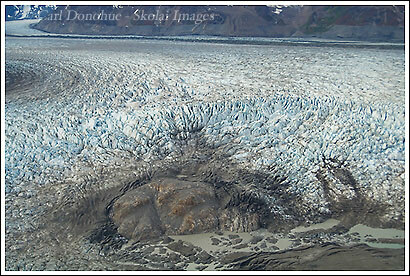 This entry was posted in Adventures, Aerial Photos, Alaska, Landscapes, Travel, Wrangell - St. Elias National Park on September 16, 2008 by Carl D.
Thanks for the post. Every summer I see people do exactly what you described. ‘Hey, let’s walk over there’ is easier to say than do, many times. Glaicers look so cool from the air! You can really see the patterns and get a feel for how they flow. Nice stuff man! They sure do look cool. I was checking out Paul Souders’ new site the other day .. he has a KILLER aerial of a glacier in Kluane .. that guy’s insanely good. Really interesting perspective – that rock could just as well be one that is a couple feet in front of you. Shooting these from the air is wild – because there’s no point of reference for scale other than all these huge mountains around, it can really be difficult to gauge accurately. I’d love to spend a bit more time – this was from one quick fly over on our way to the landing strip.